Popular image editing app Pixelmator was today updated to version 3.3.2, introducing a more powerful repair tool and introducing support for the new Photos app and the Force Touch trackpad found in the new MacBook and the recently updated 13-inch Retina MacBook Pro. 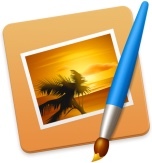 Pixelmator's repair tool (the bandaid icon in the app) lets users remove unwanted objects from photos in just a few minutes using a paintbrush, and in 3.3.2, the repair tool has been improved to be faster and more efficient, resulting in even cleaner results when removing an object from an image. Repair tool is one of our many secret scientific projects that is fun and interesting to work with. We even used the new Mac Pro (because it's extremely fast and powerful) to automatically improve our Repair technology algorithms. Since there are numerous ways to repair any area of an image, our Mac Pro worked incredibly hard for months to find the best algorithm. It analyzed millions of possible ways to repair areas of various complexity and then it compared the speed and quality ratio of each final result. Lastly, our Mac Pro (this is really awesome) derived with a repairing strategy that gives the optimal result every single time. How smart is that! After updating to 3.3.2, Pixelmator users with a Force Touch trackpad can use it for pressure sensitive painting. The Force Touch trackpad sensors detect how much pressure is being applied to the trackpad, and Pixelmator uses that information to change the size of the brush while painting for thicker or thinner lines. With Photos for OS X support, also included in the new update, Pixelmator users can access their Photos libraries from within the Photos Browser inside the Pixelmator app. I'd be more impressed if Photoshop hadn't already had this exact tool for several years already. Still, for $30, that's pretty freaking cool. Pixelmator *has* had this tool for as long as I can remember. They have simply made it better. If you knew your way around Photoshop, you can do 90% of what anyone would ever want to do with PS in Pixelmator. I've never looked back. Sure there are things that are not as easy, but they can still get done. "With the new, smarter repair tool in Pixelmator 3.3.2, you can now quickly and easily remove unwanted elements." Been using Pixelmator for what feels like a few years and I love it. Such an amazing value. Yeah, I think I've had it for a couple of years too, scored it on a sale at $14.99, probably the best cost-to-value ratio of any major app I've ever scored. Not only has it been super useful and feature rich, but it's incredibly stable - I know I'm probably tempting fate, but I've _never_ had any technical/runtime issues with it. With Aperature not getting any updates, and Photos unable to do anything of this level, I am left with a choice, Pixlemator for $30 or Adobe for a monthly charge. So, I think I will download pixlemator tonight. If you talk value per $$ spend on the app, Pixelmator is the best app out there. Totally amazing and deserves all the awards it gets. And the app is getting so very close to a photoshop replacement for many people. And with the subscription model Adobe is using now, I think Pixelmator is the way to go for most people now. How the Pixelmator crew can keep the app so cheap I don't know. While Adobe does the same thing with their demonstrations, Pixelmator chose a VERY friendly image to showcase this feature. The lines of the stairs are pretty straight and overall it's a pretty predictable outcome. I'm not trying to take away anything from the new feature but let's not get too excited. Photoshop's "Content-aware" feature is the same thing and has it's limits as well. To be fair to Pixelmator, I've just been trying it and it seems to be working far FAR better than Photoshop's content aware ever has - at least for me trying about half a dozen different examples. I've used content aware mainly on CS5 (the last version of PS I could buy without having to rent it). However, I did run a trial of PS CC 2014 and that wasn't much better in the content aware features to CS5, although I didn't use that feature exhaustively, if I'm being honest. On the face of it, Pixelmator looks to be doing a far better job than PS. That's just my thoughts on it having tried a few tests.